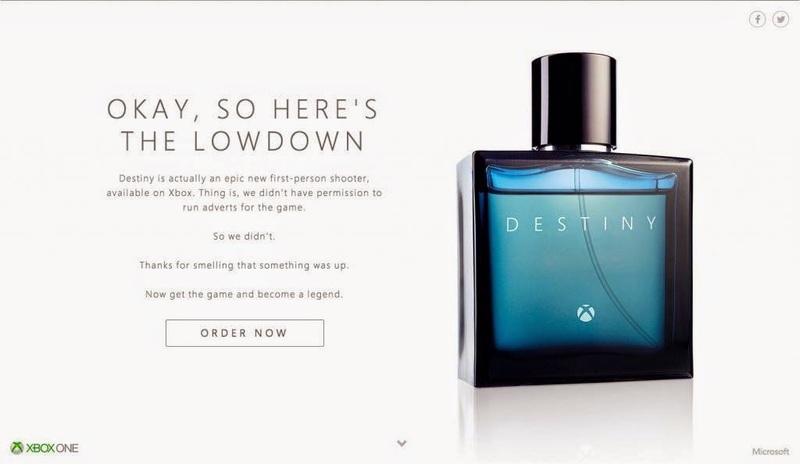 Destiny: The new fragrance by Xbox? Xbox Destiny: The new fragrance by Xbox. The idea of exclusive games, or exclusive downloadable content deals, have been commonplace in gaming for years. But less well known are deals that stop a rival console manufacturer from promoting the fact that a game has been released on their format. One of these is in place for Destiny, which Sony are treating almost like a first party game – despite the fact that it’s also being released on Xbox 360 and Xbox One as well. So another Xbox product had to be created and advertised that just happened to have the same name. Readers could then visit a campaign microsite (has been pulled since) or use the Blippar app to reveal the true story, as well as link to retailers to buy the Xbox version of the game. In just the first few hours, the site had more than 50,000 unique users, but more importantly, with one quick hit just days before the game’s launch, a strong link was forged between the names ‘Xbox' and 'Destiny' in the audience's mind. AdStasher: Destiny: The new fragrance by Xbox?